"Words are heavy. They're like stones. If birds could talk they couldn't fly. *" This quote from my favorite TV show Northern Exposure perfectly expresses my feelings about words (anyone who's met me knows I save the bulk of my words for this blog). Words are hard. Sometimes words aren't enough to express our thoughts and feelings (as Evan Hanson sings, "words fail"). And words are open to interpretation, sometimes they come out differently than how we intended them. 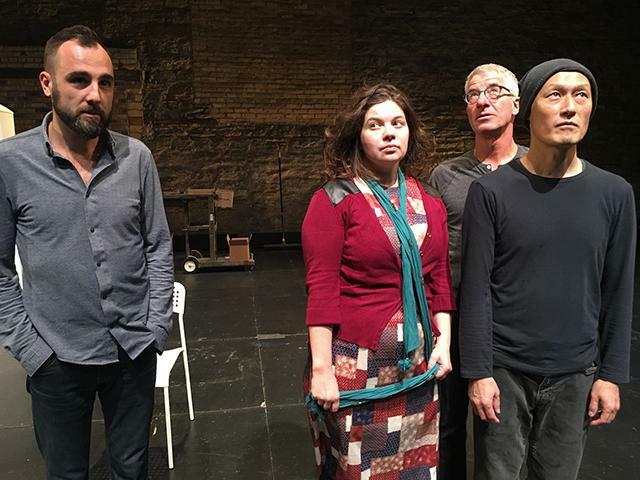 The Moving Company (one of my favorite #TCTheater companies in the last six years, since seeing Come Hell and High Water in 2011) has taken that idea of the inadequacy of words and extended it into a 75-minute wordless (but not entirely silent) exploration of... well... a bunch of stuff. 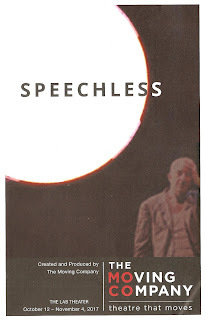 Created by the five-person ensemble under the direction of Dominique Serrand and using movement, music, and a little how'd-they-do-that theater magic, Speechless is poignant, heart-breaking, funny, and mesmerizing. It feels awkward to use words to describe this wordless piece. I don't want to tell you what it's "about," because it will likely bring up different thoughts and feelings in everyone who experiences is, which is the beauty of art - we filter it through our own personal experiences. But some of the themes I took away from the show are the death of hope many of us have experienced in the last year, the voicelessness of women in many cultures and areas of society, a sort of "emperor-has-no-clothes" vibe, the importance of supporting each other through the dark times, and the promise of good things to come and the rebirth of hope. Everyone in the ensemble (consisting of company members Nathan Keepers and Steven Epp, along with Heidi Bakke, Holo Lue Choy, and Masanari Kawahara) is so open and expressive and interesting to watch. The set and props seem simple, until things break and come back together, water is added, and the most beautiful mosaic is created out of colored sand (or chalk dust?). The actors shed their somber black and grey clothing in favor of items more colorful and alive. And while there are no words, the show is not silent. Rather a soundtrack of gorgeous orchestral and choral music (including Brahms, Schubert, Tchaikovsky, Elgar, and Korngold) perfectly accompanies the movement and expression of the actors. Or vice versa. Either way it's beautifully constructed (set design by Dominique Serrand, costume design by Sonya Berlovitz, sound design by Justin Burk). This is The Moving Company I know and love. I lost faith in them a little after their spring performance of Refugia at the Guthrie and the resulting conversation** (you can read more about that here, here, and here). I'm still not sure what to think about all of that, but Speechless is a show from their heart, and it's true and beautiful. Continuing through November 4 in the gorgeous space that is the Lab Theater (note that the Lab now has exclusive parking directly across the street for $5, pay in the lobby of the theater). Marilyn: They weigh you down. If birds talked they couldn't fly. **The Twin Cities Theater Bloggers have continued the conversation about diversity, inclusion, and representation in our monthly discussion series called "Continuing the Conversation." Our next event will be held on Monday October 30 at Sandbox, focusing on LGBTQIA inclusion in #TCTheater, with panelists Claire Avitabile, Hector Chavarria, and Marcel Michelle-Mobama. Please join us! More info can be found on the Facebook event page (no reservation necessary).